The Sobor of the ArchAngel Gabriel is celebrated on the day following after the Annunciation/Blagoveschenie, ie. 26 March. This feast is celebrated a second time 13 July. The reason for its being established probably served the dedication in the XVII Cent. of a church at Constantinople, constructed in the name of the Holy Archi-Strategos / Chief of the Heavenly Hosts. The Archangel Gabriel was chosen by the Lord to make the blest-announcement to the Virgin Mary about the Incarnation of the Son of God from Her, to the great rejoicing of all mankind. Therefore on the day after the feast of the Annunciation – the day itself on which the All-Pure Virgin Herself is glorified, we give thanks to the Lord and we venerate His messenger Gabriel, who contributed to the mystery of our salvation. 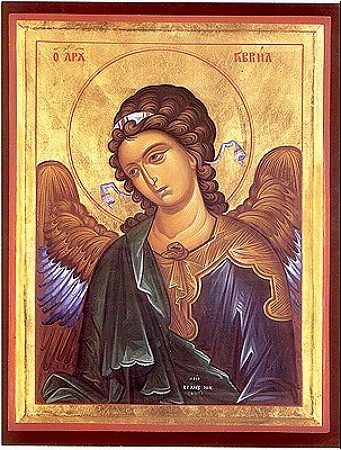 The holy Archistrategos (Leader of the Heavenly Hosts) Gabriel acted in service to the Almighty God. He announced to Old Testament mankind about the future Incarnation of the Son of God; he inspired the Prophet Moses during the writing of the Pentateuch books of the Bible, he announced to the Prophet Daniel about the coming tribulations of the Hebrew People (Dan. 8: 16, 9: 21-24); he appeared to Righteous Anna with the news of the birth from her of the Ever-Blessed Virgin Mary. The holy Archangel Gabriel stayed constantly with the Holy Virgin Mary when She was a child in the Jerusalem Temple and afterwards watched over Her throughout all Her earthly life. He appeared to the Priest Zachariah, foretelling the birth of the Forerunner of the Lord – John the Baptist. The Lord dispatched him to Saint Joseph the Betrothed: he appeared to him in a dream, to reveal to him the mystery of the Incarnation of the Son of God from the All-Pure Virgin Mary, and warned him of the wicked intentions of Herod, ordering him to flee into Egypt with the Divine-Infant and the Mother of God. When the Lord before His Passion prayed in the Garden of Gethsemane to the extent of sweating blood, according to Church tradition, to strengthen Him there was sent from Heaven the Archangel Gabriel, whose very name signifies "Strength of God" (Lk. 22: 43).